[S542] Betty Curran, "Western Floyds," e-mail to MVW, Feb 2004. [S55] 1870 Census;, House # 566. [S56] 1880 Census;, shown on this census as Andrew S.
DEED 10 October 1783� He was shown on a deed on 10 October 1783 at Franklin, NC, A Land grant for Shadrack Floyd was for 150 acres in Franklin lying on waters of Cypress Creek. 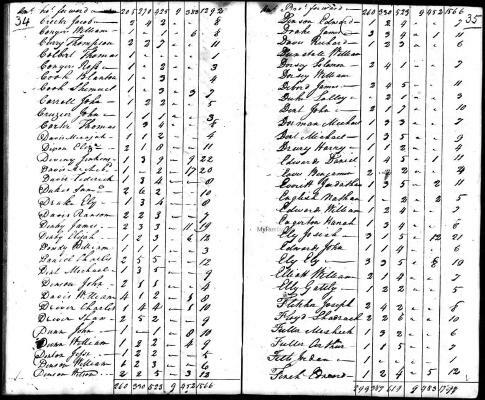 [S47] 1790 Census;, There were two males over 16, two under 16, three females and no slaves. [S50] 1830 Census;, p. 138. [S52] 1850 Census;, HH 759 Upper 5th Dist. MARRIAGE* 18 May 1888� He married Bettie Stewart on 18 May 1888 at GA "Sometime prior to the 1900 Census Tom left town with his brother in-law's widow and second wife Betty "Bett" Stewart. Shade Floyd was married to Eliza Davis (Tom's sister) then Bett Stewart. 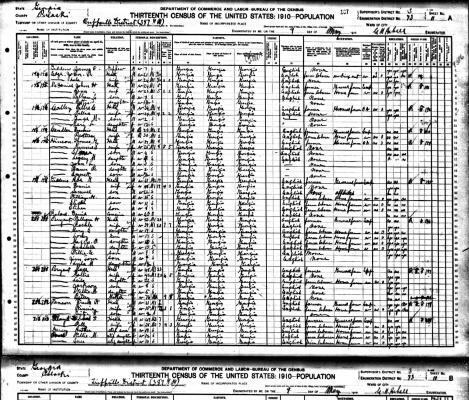 Tom and Bet are found in the 1900 census living in Henry County, Alabama. Tom and Bett later moved to Rebecca Georgia where they both died. 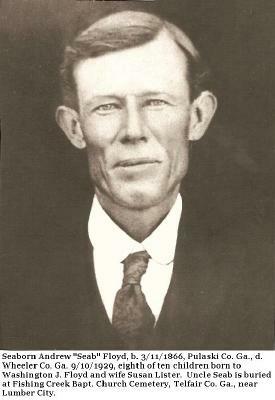 Bett died of TB and is buried in Pleasant Hill Cemetery without a headstone." These pages show Amos, Shade and James E. as well as other Floyds living very close to one another. 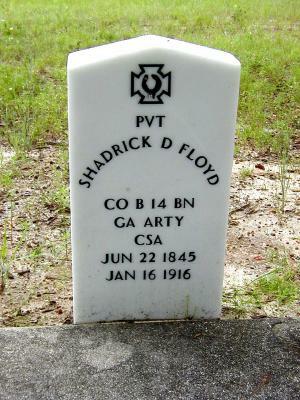 From unpublished records compiled by Lillian Henderson for the State of Georgia we learn that: Shade D. Floyd enlisted as a private in Company B 14th Battalion Georgia Light Artillery on March 25, 1864. He surrendered at Greensboro, North Carolina April 26, 1864. The captain of this company was Thomas H. Dawson. A letter addressed to Mr. Ruel Anderson of Hawkinsville, Georgia dated February 14, 1951 seeks information about Shade Floyd's service in Capt. Ruel Anderson's regiment. Addressee is the grandson of Capt. Anderson. The response is a short note stating: Your grandfather (Mr. 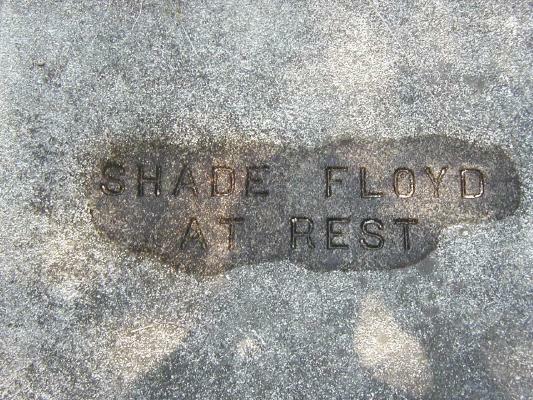 Shade Floyd) was in my father's company, Anderson's Battery. They fought in the Battle of Chattanooga and Missionary Ridge and the Battle of Atlanta and New Hope Church, Jonesboro, Georgia and other battles on down through Georgia. Signed by what appears to be Harriet (last name illegible) Note: perhaps she is the daughter of the Captain. The Civil War Records at the Georgia Department of Archives and History show S.D. Floyd receiving an Indigent Pension on the basis of service in Company B. of Montgomery's Artillery. It was signed by him with an "X" on September. 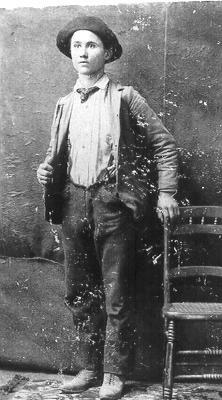 13, 1901 and states that he was born on June 22, 1845 in Pulaski Co., Georgia, was with Company B in Dalton, Georgia on December 1863 also in Anderson's Battery. He served nearly two years and surrendered in Greensboro, NC. April 1865. He based application for pension on infirmity and poverty. "I was wounded during the war in the hip and have never been entirely well since - have frequent attacks of Rheumatism - general breaking down. Possess no property (none shown for years 1894-1899) and am supported by the labor of "my two sons" In response to the question of "Do you have a homestead?" he replied "No". 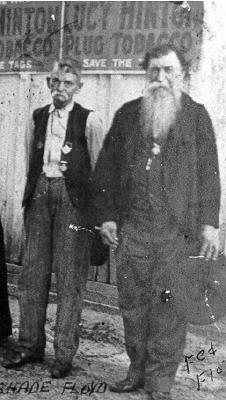 The affidavit was witnessed by J.C. Grimsley who said he enlisted with S. D. and served with him, surrendered with him at Greensboro and has lived within three miles of him for forty years. Physicians Affidavit - Description of precise physical condition ".. Struck by a shell at Savannah, Ga. in 1864 during an engagement, as result has never been strong and vigorous since. Since then he has suffered with general debility from soul (depression? ), also suffers from recurrent attacks of Rheumatism. Pension was recorded as received in 1902-1906 starting at age 56. Shade Floyd must have been embarrassed to ask for this indigent pension which required the acknowledgement and witness of his neighbors. The fact that it was needed, and that he was reduced to the level of requesting a pension gives a hint of the emotional and economic damage imposed on a whole generation by the terrible Civil War. What would Shade think if he could know that his suffering would be discovered and memorialized more than one hundred years after its occurrence? Would he recognize that his humiliating act which would be so carefully recorded in the state archives would upon its discovery shed a bright spot light on the most tragic and dark period of southern history? In an unwitting way, Shade's story like the story of his grandparents, Fed and Mourning Floyd serves to illuminate our past. Just as Frederick and Mourning were unknowing contributors to a history they could not read. And, just as their daughter, Francis Mary Ann became an accidental recorder of history when she chose to record her family's births in the Floyd family Bible, so too was Shadrach's act of humiliation became a key piece to a larger puzzle of life. Because of his need for the pension, and because of the state's persistent need to supply documention and affidavits his descendants can better know and appreciate the heritage won for us at so great a cost. Shade Floyd owned no land, left no possessions and held no office, but he did not live in vain. The few family stories told in the mid twentieth century indicate that when Shadrick Floyd returned from the war, the only job available was that of filling stump holes on the farm of his half brother, Everett Floyd. Considering the devastation done to the South's economy by the war it is plain that Shade would have counted himself fortunate to have even this job for support. As a young man of only twenty years who had already experienced the traumas of life, Shade married Eliza Davis on July 1, 1866. Eliza was from a large family who lived near the area of the hauntingly beautiful moss-draped cypress swamp known as Bush's Mill. Eliza would die prematurely at the age of thirty-eight and only four of her children would survive her. The four were named: Archie, Anna Letitia (Sis), Mary Elizabeth (Babe), and James Edward who was born on March 25, 1875. Shade also worked in a turpentine still. The distillation of turpentine is tough and dirty work involving a difficult procedure. Perhaps the sight of his father working so hard for someone else was a strong lesson for James Edward Floyd. He grew up in poverty, saw what it was like not to own land, and even knew the feeling of living in a home that belonged to someone else. Perhaps these are the lessons that forged the desire for a better life that would carry the next generation of the family into the twentieth century as land-owning successful businessmen. 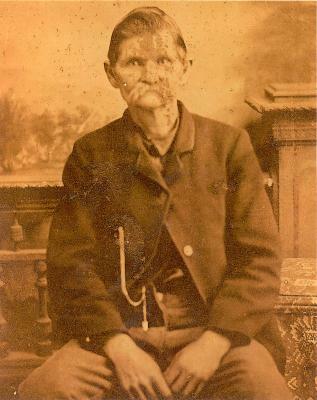 For the Civil War veteran, Shade Floyd, life never got much better. The turpentine still at Bailey's Park was within walking distance of the Everett Floyd place. Everett was Shade's half brother, and it was upon a piece of Everett's land that Eliza Davis Floyd, Shade's wife, was buried at a time of the year when the dogwood trees were their most glorious. What powerful feelings must have passed through the hearts of this family, emotions magnified to double size for the youngest son, James Edward Floyd who was only thirteen years old when his mother died? Certainly the events of his parents lives contributed to his discipline and conviction and the self-sufficiency that would be so evident throughout his life. Note* 2002� This note from Shade's grandaughter, Annette Kaplan, describes BAILEY'S PARK. The only thing I rememberer from my childhood is that there was a small country store there and at election time it was a precinct where they counted the paper ballots and checked for Pole tax and Papa, James Edward Floyd, was always one of the officials at election time. There was also a swimming pool fed by boiling springs of icy cold, crystal clear water at the bottom of the hill with a changing room bath house for males and one side for females and we used to dive off the top into the pool. This all indicates to me that it was a small recreation area. 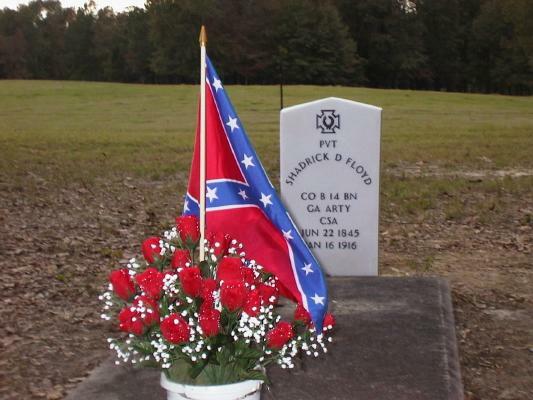 Civil War Memorial* November 2002� In November 2002 at Bleckley County, GA, In 2002, the work begun fifty years earlier by Tina Floyd was completed with the installation of a Civil War marker on Shade Floyd's grave. About 100 family members attended the ceremony which was marked by a canon salute from the local Civil War Historical group. [S109] Unknown subject State Archives of Georgia. [S106] Unknown subject unknown repository. [S335] Unknown subject unknown repository. [S107] Unknown subject unknown repository. [S108] Unknown subject unknown repository. [S55] 1870 Census;, House # 870. [S59] 1900 Census;, Living alone at age 53 with father Amos. 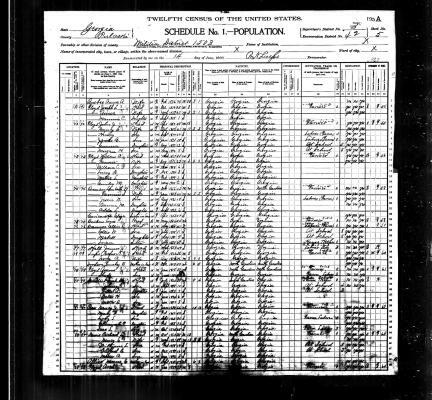 [S61] 1920 Census;, Sown living with his siblings. [S577] Bill Jones, "Bill Jones," e-mail to MVW, January 2006. 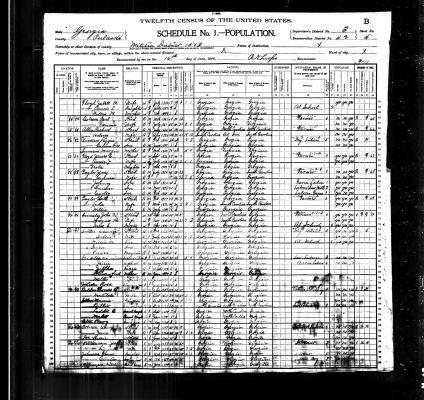 [S56] 1880 Census;, Living in house # 447 with parents. [S55] 1870 Census;, Living in house # 889 with parents. [S56] 1880 Census;, Living in house # 447 with wife. [S148] Unknown subject unknown repository. The Floyd family is a fascinating study, veiled at times with mystery and often muddled by elfish unpredictability. They are unique. They are rare. They are elusive. But 35 years of persistent research has uncovered some amazing stories about them, who they were, and who they married. Still, there are gaps in the story, much like missing pieces from a jigsaw puzzle. When the puzzle is assembled to near completion, the viewer can analyze the shape and size of the missing pieces and gain additional clues to what they are by observing the scenery around them. The Floyds of the past can be found. That is a fact. But don’t count on doing it without considerable work and perseverance. Their greatest talent, it seems, was the ability to marry well. This suggests that they were a handsome and strong lot and were attractive to women needing safety amid unsafe surroundings. And when we say, “marry well” we are talking, for example, about an 1803 wedding in North Carolina where Mourning Bass, a descendant from the high wealth of London, married Federick Floyd, a man of humble background. Mourning’s earliest Bass ancestor to make a home in Virginia was John Basse (the original French spelling) along with his Nansemond Indian wife. But Mourning’s rich genealogical trail goes back further to London and to the elite of Northern France. The Basse families were among the few Europeans to settle in Virginia about 1618 and survive the Powhatan Indian Massacre of 1622 when 347 Englishmen were slain. John remembered London well, but he soon found himself adjusting in Virginia to what circumstances required. During this ongoing lifestyle change, he married the daughter of the king of the militant Nansemond Nation (called tribe today) and chose to live with the Nansemonds, thereby enjoying the protection afforded to his Nansemond wife. As we continue our research today we often find family historical nuggets that are nothing short of phenomenal. One such story features Nathaniel Basse, who in 1616 inherited his father’s stock in The Virginia Company, a corporation intended as a moneymaking enterprise in The New World. But that stock was only a very small portion of Humfrey Basse’s overall wealth in London. He left a will that is one of the longest in English history. The stock most likely brought Nathaniel to Virginia for further investment. Before it was over, however, he most likely suffered some financial losses. So did The Virginia Company which never turned a profit. Beginning about 1622, Nathaniel Basse operated Basse’s Choice, a plantation commonly called a hundred, south of the James River very near present-day Smithfield. He also served in the House of Burgesses in 1623 and 1629, and he served in the Colonial Council between 1624 and 1629 and was the chief judicial authority in the area of Basse’s Choice. He also traveled, under orders of the governor, to such places as Nova Scotia, Dutch settlements and possibly the West Indies to negotiate trade deals. He was a key figure in early American history but history books have for the most part ignored him. About 1623, after apparently coming to America from Northern Ireland and possibly having a link to southwestern Scotland (this is not proven), Thomas Floyd lived at West and Sherlow Hundred near Jamestown, as is documented by early records. After examining the records of all Floyds of the 17th century in Virginia and surrounding areas between 1618 and 1700, we conclude that this Thomas Floyd most likely was our first ancestor, in Virginia, but we have no proof. The Floyd family became centered in Isle of Wight County, Va., and there were many there by 1700. Other Floyds lived in various parts of the colony, but none seemed to be related to us. Some of them, in fact, most likely were Welsh. Family oral history says we are Irish, but it is possible – though not proven – that we are Scots-Irish, who lived in Northern Ireland and originally were from Scotland. One factor that impedes research of our Floyds is our rarity. The National Genographic Project along with National Geographic have confirmed that our Floyds possess DNA that places us in Haplogroup G, which makes up about 3 percent of the world’s population, and the Floyds make up a small fraction of that 3 percent. One of the more exciting features of the Floyd story is its link with two men of kinship who put America on a course toward permanency and eventually toward national sovereignty. Nathaniel Basse was one. Another was Basse’s father in law, Samuel Jordan, who was among a handful of Englishmen involved in saving Jamestown from collapse during its darkest hour about 1610. Three months before The Mayflower, Samuel Jordan in June 1609 boarded The Sea Venture in Plymouth and set sail for the New World. The recently built state-of-the art vessel, was one of eight ships to set sail that day on a mission called The Third Supply, providing new settlers and provisions for a corporation called Virginia. Six to eight weeks out, the flotilla ran into a powerful storm – assumed to be a hurricane – and was pummeled for almost 48 hours. The Sea Venture could not hold up during the storm because it had a major flaw. Its calking had not been allowed to thoroughly dry before the ship’s departure. The other seven ships survived and proceeded to Jamestown. The Sea Venture, meanwhile, was foundering somewhere in the unseen distance. Directly, the ship’s master spotted land and ordered the ship in that direction. The ship became snared between two coral reefs – which may have been a saving factor for the passengers. The ship never sank and all passengers and crew were believed to have survived. However, there were some deaths on land weeks to months after the passengers went ashore. Their temporary home there was not just any ordinary spot on the globe. As it turns out, they were stranded in the Bermudas where bizarre maritime mysteries today are all the rage and UFO theories are seemingly delivered to TV stations by the truckload. Samuel Jordan and the rest undertook to build two small ships from Sea Venture salvage and from such native Bermuda resources as cedar. It took 10 months or so to finish the two ships and then set sail for Jamestown in 1610. Samuel Jordan and the others apparently had lived in a healthy environment in the Bermudas. After arriving in Jamestown, they were shocked by what they saw: blank stares, emaciated bodies, disarray, and a seeming desire to flee the misery of life. Of a one-time population of about 500, only 50 or so were left, and they were planning to set sail for England the next day. But Samuel Jordan and his associates were able to revive their spirits, provide food for the hungry and comfort the sick. Within a few days, the 50 were feeling good about staying in Virginia. It was one of the most important developments in American history – perhaps the most important. Without it, today’s America would not exist. Instead, Spain would rule. It is reported that Spain had already used spies and poison against Jamestown. Note* before 1700� Before 1700 at VA There were a number of Floyds in 17th century Virginia. The first was Nathaniel said to have been age 25 when he came from England in the early 1600's. Don Floyd does not think he was an ancestor because there are no Nathaniels in later generations In addition there was an Edward probably born about 1665 and a couple of later Nathaniels as well as Thomas and Francis. We may never know who was the father of Thomas the first husband of Joanna Lowry, but the more I research the more I become convinced that our earliest known Floyd ancestor is Thomas husband of Joanna Goodson. A deed in 1699 in Virginia from Edward Cobb (the Cobbs seemed to live near the Lowrys and the Lowrys lived near the Floyds) gives a boundry line of "Floyds Creek that ran out of Pagan Creek". The fact that a creek is named Floyd implies that the land has been held for a while and was widely known as a landmark. Note 2004� In 2004 Here is a note I wrote to Don Floyd along with his reply. It may prove useful for future research. "Have you examined a 1993 book called Isle of Wight County, Va Deeds 1647-1719 by William Lindsay Hopkins? Several years ago I tried to get it on interlibrary loan, but the best I could get were all the references to Bass and Floyd. Its taken me two years to get around to digesting what I have here and that is the source of my recent interest in the early Floyds. The book lists Edward, Frances, Harry, Nathaniel and Thomas Floyd. I don't think Harry is ours as he lives in the upper county and ours lived in the lower county. A John Portis, Jr. with a wife named Deborah is mentioned as well as a John Portis Sr. connected with William Boddie These entries are for 1694 and 1698. In addition I find an Edward Goodson (could be Joana's father.) Nathaniel is listed only once and his land is described as being on a neck of land on the main creek of Warrrisquake Bay." There are both a Thomas Floyd and a Matthew Lowry who appear numerous times in the records about 1711 (the year that Joanna likely would have started having children) Joanna has children named both Thomas Floyd and Matthew Lowry, but neither this Thomas(#1071) nor Matthew can be Joanna's children as she did not marry Lowry until after 1724 as evidenced by her father's will of that year where she is called Floid. I believe she married Thomas Floyd (#1071) first and then married his friend Matthew Lowry when Thomas died. This also explains her use of their names. There are two estate appraisements in Isle of Wight. One for Francis Floyd in 1741 and the other for Thomas Floyd in 1760. 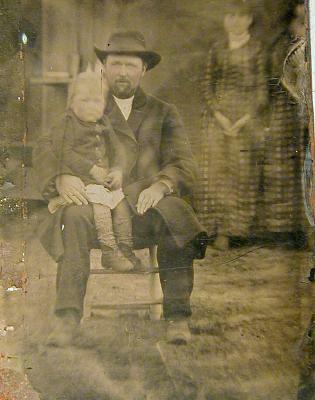 I believe that one or the other of these is Joanna's father-in-law and the other is his brother. Neither can be Joanna's children as there is a full and complete record of her Thomas and Francis in North Carolina and they died well after the above dates. [S617] James Lowry, "Lowry," e-mail to MVW, Feb 18, 2007. Death* before 27 July 1780� He died before 27 July 1780 at Northampton, NC, He is shown on the Bute county Tax list having come from Edgecomb. In the records of Bute (Vol. II Journal of NC Geneology) he is shown as having three slaves and a son named Amos. It was the son named Amos that caused me to think he is the father of Amos, Shadrick and Fed Floyd. I've only found one Amos in the area. Biography* 1999� In 1999 Here are some thoughts MVW recorded while attempting to sort out the early Floyd family: PERHAPS this is the same Thomas who appears in the 1771 records of Bute County and is shown as having a son and three slaves. If this assumption can be proved correct, it links the Virginia and North Carolina Floyds. The appearance of a Floyd in 1771 is one of the earliest events documented of the existence and location of a Floyd ancestor in North Carolina. In fact, Thomas Floyd of Bute County 1771 is a direct ancestor since there is a will for his son, Amos, who in turn names a brother Frederick, and it is the brother Frederick who married Mourning Bass and emigrated to Georgia. Even though our first probable Floyd ancestor is not officially recorded in North Carolina records until 1771 we still know that by the year 1751 the Floyds were sufficiently established in Edgecomb County, North Carolina to consider it home. They had arrived in the state from Virginia in a time of incredible growth for the area. The counties were being formed and reformed in order to meet the needs of the developing population for county government was the most essential body for early settlers. Roads were poor, postal service rudimentary and the telephone almost two hundred years in the future, and yet it was necessary for citizens to conduct business regularly at the court house. This meant that as the population grew it became necessary to create smaller and smaller counties in order to handle the increased load of business as well as get the county seat within a reasonable travel distance from the citizens it served. No farmer could afford to be away from home for extended periods of time and yet the requirements of conveying land and disposing of property meant that access to the courts be possible for all. We see large, early counties being divided and sub-divided and it is possible to track the growth of population by looking at the number of divisions as well as the rapidity with which they took place. In North Carolina one of the earliest counties was Perquimans which was formed in 1670 and from which was formed Bertie County. In 1741 Bertie developed into Northampton and Edgecomb and when we remember that Thomas Floyd of Virginia bought land in Edgecomb County in 1746 only five years after the formation of the county, we see that he was one on the many whose entrance into the area caused this cell-like division and redivision of the counties. It would only take seventeen years until in 1758 Halifax County split from Edgecomb and then again twenty years later in 1777 Nash County appeared from Edgecomb. A glimpse at court records reveals many of the day to day details of colonial life. It seems that there was always some detail of life that required a court appearance. There were wills to be presented for probate, reports to orphan's court regarding the minor children in ones care as a result of some parents untimely death. There were Letters of Administration to secure, Reports of Appraisals and the ever present duty of jury service. Court days were scheduled regularly so that those having business would be in town and it is possible to find an ancestor listed as a witness at a trial or to a document, will or deed letting us know that on that date a particular person was in town on business. Citizens of the twentieth century often handle routine matters by letter and seldom see the inside of a court house. Their ancestors were ever more familiar with an institution that next to the church was the central rallying point of civilization. [S87] Unknown subject unknown repository. [S490] Donald R. Floyd, The Elusive Floyds, p.51. [S535] Unknown compiler, Franklin Probate. [S46] 1800 Census;, Not sure if this is the same Thomas, but its possible. he Floyd family is a fascinating study, veiled at times with mystery and often muddled by elfish unpredictability. They are unique. They are rare. They are elusive. But persistent research over a span of 35 years has uncovered some amazing stories about them, who they were, and whom they married. Still, there are gaps in the story, much like missing pieces from a jigsaw puzzle. When the puzzle is assembled to near completion, the viewer can analyze the shape and size of the missing pieces and gain additional clues to what they are by observing the scenery around them. We consider our book, The Elusive Floyds, a beginning. Future research will reveal more. The Floyds are elusive, but they can be found. Their greatest talent, it seems, was the ability to marry well. This suggests that they were a handsome and strong lot and were attractive to women needing safety amid unsafe surroundings. And when we say “marry well,” we are talking, for example, about an 1803 wedding in North Carolina where Mourning Bass, a descendant from the high wealth of London, married Federick Floyd, a man of humble background. Mourning’s earliest Bass ancestor to make a home in Virginia was John Basse (the original French spelling) along with his Nansemond Indian wife. But Mourning’s rich genealogical trail goes back further to London and to the elite families of Northern France. The Basse family were among the few Europeans to settle in Virginia about 1618 and survive the Powhatan Indian Massacre of 1622 when 347 Englishmen were slain. John remembered London well, but he soon found himself adjusting in Virginia to what circumstances required. During this ongoing lifestyle change, he married the daughter of the king of the militant Nansemond Nation (called tribe today) in 1638 and chose to live with the Nansemond Indians, thereby enjoying the protection afforded to his Nansemond wife. As we continue our research today, we often find family historical nuggets that are nothing short of phenomenal. One such story features Nathaniel Basse, who in 1616 inherited his father’s stock in The Virginia Company. But that stock was only a very small portion of Humfrey Basse’s overall wealth. He left a will in London that is one of the longest in English history. The stock most likely brought Nathaniel to Virginia for further investment. Before it was over, however, he most likely suffered financial losses, as was the case with The Virginia Company, which never turned a profit, when its charter was revoked by King James I. Beginning about 1622, Nathaniel Basse operated Basse’s Choice, a plantation commonly called a hundred, south of the James River very near present-day Smithfield. He also served in the House of Burgesses in 1623 and 1629, and in the Colonial Council between 1624 and 1629 and was the chief judicial authority in the area of Basse’s Choice. As a member of the House of Burgesses, he was instrumental in developing the model of representation for all future colonies, including Massachusetts. He also traveled, under orders of the governor, to such places as Nova Scotia, Dutch settlements and possibly the West Indies to negotiate trade deals. He was a key figure in early American history but history books have for the most part ignored him. About 1623, after apparently coming to America from Northern Ireland and possibly having a link to southwestern Scotland, Thomas Floyd lived at West and Sherlow Hundred near Jamestown. Living at West and Sherlow suggests that he was an indentured servant working on the plantation. After examining the records of all Floyds of the 17th century in Virginia and surrounding areas between 1618 and 1700, we conclude that this Thomas Floyd most likely was our first ancestor in Virginia, but we have no proof. Our Floyds became centered in Isle of Wight County, Va. Family oral history says we are Irish, but it is possible that we are Scots-Irish, who lived in Northern Ireland and originally were from Scotland. One of the more exciting features of the Floyd story is its link with two men of kinship who put America on a course toward permanency and eventually toward national sovereignty. Nathaniel Basse was one. Another was Basse’s father-in-law Samuel Jordan, who was among a handful of Englishmen involved in saving Jamestown from collapse during its darkest hour about 1610. Three months before The Mayflower, Samuel Jordan in June 1609 boarded The Sea Venture in Plymouth and set sail for the New World. The recently built state-of-the-art vessel was one of eight ships to set sail that day on a mission called The Third Supply, providing new settlers and provisions for a corporation called Virginia. Six to eight weeks out, the flotilla ran into a powerful storm – assumed to be a hurricane – and was pummeled for almost 48 hours. The Sea Venture could not hold up during the storm because it had a major flaw. Its caulking had not been allowed to thoroughly dry before the ship’s departure at Plymouth. The other seven ships survived and proceeded to Jamestown. The Sea Venture, meanwhile, was foundering somewhere in the unseen distance. Directly, the ship’s master spotted land – the Bermudas – and ordered the ship in that direction. The ship became snared between two coral reefs – which may have been a saving factor for the passengers and crew. The ship never sank and all passengers and crew were believed to have survived. However, there were some deaths on land weeks to months after the passengers and crew went ashore. A star in the making in the Bermudas was a possible kinsman of Samuel Jordan. He was Sea Venture passenger Sylvester Jourdain, who wrote an account of the storm that bore much similarity to William Shakespeare’s “The Tempest,” but Jourdain wrote his account a good year before Shakespeare staged his play in 1611. If Shakespeare used Jourdain’s material, which was published and widely available in London as early as 1610, he did not plagiarize but simply used a journalistic account as a basis for his story. He also could have drawn from at least one other account. Both Jordan and Jourdain originally were from Dorsetshire. Samuel Jordan and the rest in the Bermudas undertook to build two small ships from Sea Venture salvage and from such native resources as cedar. It took 10 months or so to finish the two ships and then set sail for Jamestown in 1610. Samuel Jordan and the others apparently had lived in a healthy environment in the Bermudas. After arriving in Jamestown, they were shocked by what they saw: blank stares, emaciated bodies, disarray, and a seeming desire to flee the misery of life. Of a one-time population of about 500, only 50 or so were left, and they were planning to set sail for England the next day. But Samuel Jordan and his associates were able to revive their spirits, provide food for the hungry and comfort the sick. Within a few days, the 50 were feeling good about staying in Virginia. It was one of the most important developments in American history. Without it, today’s America most likely would not exist. Instead, Spain likely would rule. It is reported that Spain had already used spies and poison against Jamestown. presenting a human story – a story made up of many human stories. We have, for the most part, shunned lists. We want to bring you face to face with your ancestors so that you might see who they were and how they lived. After all, when you look in the mirror today, they are there looking back. December 12, 1741 Thomas Floyd was a witness to the sale of 300 acres on the south side of Swift Creek by Thomas West and wife Sarah of Edgecombe County to Captain William Kinchin (Kinchen) of Northampton County for 35 pounds Virginia money. November 16, 1747 Thomas Floyd of Edgecombe County sold 200 acres on the north side of Swift Creek to George Bell of Edgecombe County for 6 pounds Virginia money. This George Bell was the apparent father of Elizabeth Bell Floyd, wife of Francis Floyd, the brother of the Thomas Floyd who migrated from Isle of Wight County, Va. We will explore the close ties between Thomas and Francis Floyd later. The 200 acres listed here were part of the 640-acre grant to John Spier in 1737. December 22, 1754 Thomas Floyd was a witness to the sale of 388 acres on the north side of Swift Creek by William Kinchen of Northampton County to Arthur Bell of Edgecombe County. Arthur Bell was the apparent son of George Bell and the brother of Elizabeth Bell Floyd, wife of Francis Floyd, the latter of whom was the brother of the Thomas Floyd from Isle of Wight County, Va.
March 7, 1755 Thomas Floyd of Edgecombe County sold 149 acres on both sides of Fishing Creek to William Bawmer for 15 pounds Virginia money. This was the same 149 acres he bought from Walter Pitts in 1753, and the net profit was 5 pounds. Witnesses were William Portis and Mathew Lowry, the latter of whom was the probable (almost certain) half brother of Thomas Floyd from Isle of Wight County, Va.
December 15, 1755 Thomas Floyds land is shown as adjoining that of Francis Floyd who just bought 288 acres on the north side of Swift Creek from William Kinchen of Northampton County. [S594] Unknown author, "Cameron/Beckwith," e-mail to MVW, Dec 12, 2006.